In this second New 52 volume, The Scarecrow has returned! The villainous genius has always preyed on the worst fears of his victims, but now he's refined his fear toxin to greater effectiveness - and deadlier consequences. As The Scarecrow's origin is revealed, Batman must find out not only how to defeat this dangerous psychopath, but how to conquer his own worst fears. 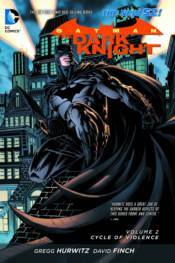 This volume collects from BATMAN: THE DARK KNIGHT #10-15 and #0.